Soos Pet Shampoo from the Sea Spa product-range is enriched with Dead sea minerals. Soos Dead Sea Spa company makes natural shampoos, conditioners, finishing sprays, topical creams, mousse and remedies for chronic pain, wounds, hot spots, damaged paws, skin conditions, acne, allergies, shedding, hair loss and yeast. Soos Pets Shampoo is the only line of pet shampoo in North America. Soos Pet Shampoo from the Sea Spa product-range is enriched with Dead sea minerals. The Soos Pets Shampoo is made with 12 essential vitamins that cannot be found anywhere else in the world. Each product of Soos Dead Sea Spa products is specifically designed to take care of your pet while training their specific needs. Soos Dead Sea Spa company makes natural shampoos, conditioners, finishing sprays, topical creams, mousse and remedies for chronic pain, wounds, hot spots, damaged paws, skin conditions, acne, allergies, shedding, hair loss and yeast. Here’s a list of contents covered under Soos Dead Sea Spa products for pets. Soos Pets is a natural pet car company that offers natural pet care products. The company has a commitment to help pet owners keep their dogs and cats healthy and happy. All Soos Pet products are 97% natural, and cruelty-free. Soos Pet care products are enriched with Dead Sea minerals. The company is also equally committed to support rescue associations throughout North America. They provide support with a portion of all proceeds donated to organizations that strive to protect animals from negligence and abuse. Soos Pet Company was found by young Canadian entrepreneurs Jpoe Benayon (22) and Yemina Kaiman (24) along with their seasoned partner and mentor Shay Shvartshtein. At Soos, you get pet care products for 3 categories. Natural pet care products for treating conditions that cause your pet severe discomfort like dry skin, skin irritations, itching and chronic pain. Natural pet products for cleansing, styling and rejuvenating your pet’s skin and coat. These include pet shampoos, conditioners, fresh scents and styling formulas. Natural pet products for gentle treatments that are tear-less and hypoallergenic. Soos Natural Dead Sea Shampoos for pets are natural products for improving the skin and coat of your pet. The ingredients used for making Soos Natural pet shampoo are made with 12 essential vitamins, essential oils and over 71 different plant herbs and extracts. They are filtered and sorted with individual natural ingredient formulas. This allows each product to address a specific need. Soos Pets Shampoo improves the lives of dogs and cats. You get good quality shampoo and conditioners in this range. Soos Pets Shampoo are paraben free and cruelty-free. You will notice positive results after just one use. Likewise, you will find your hands become more softer. It’s a proven fact that high amounts of sugar in the dog’s bloodstream may lead to critical conditions like liver, heart and kidney disease, blindness, cataracts, slow healing, increased infections etc. Try Blood Sugar Gold! natural supplement appropriate for lethargic diabetic dogs. Which are the top rated Wysong dog food distributors? Do they sell all kinds of Wysong products available at its official website. 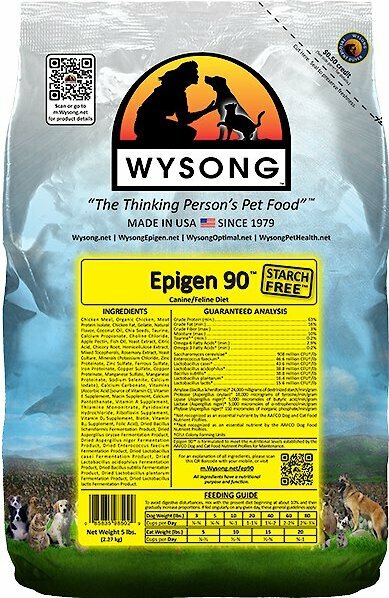 It is stated that Wysong foods are genetic appropriate diets, 100% effective to your pet’s health. Get everything on Wysong dog food store locator. Soos Dead Sea pet grooming bundle is North America’s first line of dead sea spa products for pets. They have been known for centuries in healing and revitalizing properties. In the past 30 years, the Soos have grown in popularity with mass fan base all over the world. Every bottle of Soos Pets Shampoo strengthens hair follicles, promotes stronger, softer and healthier hair growth from root to tip. Soos Pets grooming Shampoo enhances thickness and shine. It cleanses and naturally disinfect hair, by removing the dirt, oil and bacteria. Soos dead sea pet grooming bundle replenishes moisture, thereby making hair hydrated and soft. Sea elements have amazing healing and revitalizing properties. Soos dead sea pet grooming conditioner is made with dead sea salt, minerals and water. They are then combined with 71 plant, roots and extracts. Finally, they are then fortified with individual natural ingredient formulas. Each pet conditioner from Soos addresses a specific need. Best of all, Soos pet conditioner is concentrated so a little bit will go a long way. Soos Natural groomer conditioner bundle includes three 250 ml/ 8 oz sized bottles of conditioner. Soos Groomer conditioner bundle promotes hair strength, softness and shine. They also easily address common issues like proneness to dirt accumulation, undercoat build up, shedding, bald spots and dry skin. They also help balance pH levels, replenish moisture and create a protective barrier against harsh elements. The Soos natural Dead Sea hypoallergenic is a non-concentrated formula. It is made with the same quality ingredients that you see in almost Soos pet products. Only natural ingredients. Soos natural dead sea hypoallergenic pet shampoo is simply not designed for dilution. Instead it will still provide the same level of cleansing and health benefits. You can buy Soos Natural dead sea hypoallergenic shampoo for pets only online. The ingredients of Soos Natural dead sea hypoallergenic shampoo is specifically formulated for allergic pets. This formula can be used for pets with sensitive skin or chronic skin condition. Soos Natural Dead Sea hypoallergenic shampoo for dogs and cats provide instant relief for irritated skin. Soos Pets Shampoo is enriched with natural antioxidants, natural antibacterial agents and antiseptics. This natural formula nourishes skin and coat with vitamins, minerals and essential oils. Penetrates skin and hair to deeply hydrate. The ingredients of Soos Natural dead sea hypoallergenic shampoo boost immunity. It draws out toxins and impurities. Soos Natural dead sea anti-itch shampoo combines all of the health benefits of Dead sea minerals with the natural antioxidant, antiseptic and antibacterial properties of essential oils and certain vitamins. This natural ingredient formula provides instant relief from discomfort. It fights itching long after the shampoo is rinsed off. The Soos Natural Dead Sea anti-itch shampoo soothes from intense itching with Dead Sea minerals, zinc, green tea, chamomile and tea tree oil. This natural formula for dogs and cats nourishes skin and coat with vitamins, minerals and essential oils. The Soos Natural Dead Sea anti-itch shampoo possesses natural antioxidant, antiseptic and antibacterial effects. It boosts immunity and cleans fur without stripping natural oils. The product is paraben and SLS free. Almost every pet shampoos come with harsh chemicals. These chemicals strip away the natural oils, leaving your cat or dog’s skin dry and damaged. To avoid this condition, Soos provides Soos Natural Dead Sea Classic Deep Cleansing pet shampoo. This natural Soos Pets Shampoo combines all the exclusive benefits of dead sea minerals with natural antioxidant, antibacterial and antiseptic properties. It deeply cleanses, detoxifies and purifies your pet’s coat. It nourishes skin and coat with vitamins, minerals and essential oils. Soos Natural dead sea deep cleanse shampoo boosts immunity. It is safe and great for use on humans and pets. The shampoo is paraben and SLS (sulphate) free. If your dog has along hair, you need to make sure he has a healthy coat. For dogs with medium to long hair, require a special concentration of nutrients for a shiny, healthy coat. The mineral rich pet shampoos that are available on stores contain harsh chemicals. Soos Extra Strength Mineral Enriched Shampoo combines all the natural ingredients and benefits of dead sea minerals and natural ingredients. You can use this natural shampoo for pets with thick or oil prone coats. Soos Natural dead sea extra strength nourishes skin and coat with minerals, vitamins and essential oils. It helps to boost immunity in dogs and cats. The all new Soos Natural dead Sea two-in-one pet shampoo possess all the immune boosting properties and benefits of dead sea minerals. With the combination of natural ingredients and dead sea, this natural pet shampoo cleanses and calms your pet’s skin and coat, all in one quick step. Soos natural shampoo for pets are perfect for all hair types. It gets fortified with Dead Sea minerals with coconut oil, beeswax, grape seed extracts, pro vitamin B5 and Vitamin E.
The pet shampoo from Soos nourishes skin and coat with vitamins, minerals and essential oils. The natural ingredients of Soos Natural Dead Sea two in one pet shampoo penetrates hair and skin to deeply hydrate. Clears out all the toxins and impurities. With Soos Dead Sea 2-in-one shampoo, you can clear your dog’s fur without stripping natural oils. Its a 97% natural product. Soos natural dead sea two in one pet shampoo is excellent for pet owners who don’t have time for two step grooming. The shampoo combines moisture-rich immune boosting effects with benefits of Dead sea minerals. The natural ingredients of Soos Natural Dead Sea two in one shampoo and conditioner gently cleans and calms your pet’s coat and skin in one single step. Soos pets natural shampoo and conditioner boosts immunity. It protects against dryness and enhances softness and shine. It is perfect for all hair types. Soos Natural dead sea 2-in-1 shampoo and conditioner is fortified with natural ingredients and extracts from dead sea minerals. Soos Pets Shampoo clears all toxins and impurities from your pet’s body. 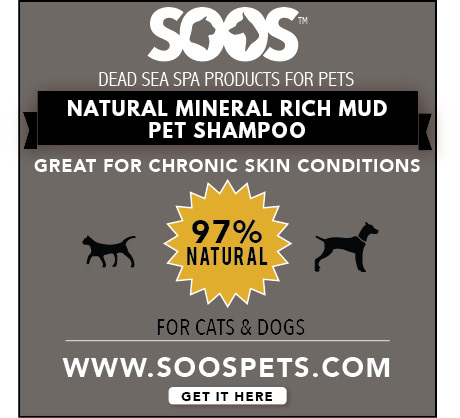 The Soos natural dead sea mineral rich mud pet shampoo detoxifies and improves circulation. It aids chronic conditions with Soos Natural Mineral mud shampoo for pets. The product comes with highest concentration of dead sea minerals and antioxidants. It gives you the highest degree of dead sea benefits. It boosts immunity and promotes healthy cell growth. The natural ingredients of Soos Pets mineral rich mud shampoo detoxifies and purifies all the toxins from your pet’s body. Perfect for aging dogs who have less hair. Soos Natural mineral rich mud shampoo treats feline and canine acne. It can also be used as a body/face wash.
tree oil and coconut oil. It penetrates hair and skin to deeply hydrate. Soos Natural dead sea tear-less puppy and kitten pet shampoo helps your kitten and puppy grow up big ans strong with healthy and hydrates skin. Knowing that this is one of the crucial stages in a puppy’s/kitten’s life, Soos has formulated this natural shampoo. The shampoo for kittens and puppy comes with tear-free formula. It is gentle enough that they won’t disturb pH levels, irritate eyes or irritate your puppy or kitten’s sensitive skin. The tear-less formula of Soos natural shampoo for kittens and puppy won’t irritate your pet’s eyes and skin. Gently moisturizes sensitive skin and replenishes moisture. Safe to use around eyes and other sensitive areas. It nourishes the skin and coat with Vitamins, essential oils and dead sea minerals. Soos Natural Dead sea puppy and kitten shampoo are safe and great for use on humans and pets. Buy Soos Natural dead sea ultra creme pet conditioner for strong and thicker coats. Its a natural foundation for your pet’s healthy coat. The thick rich creme in Soos Natural Dead sea ultra creme pet conditioner, locks in moisture and strengthens the hair follicles from root to tip. The product is weightless and comes with intensely nourishing formula. It provides smoothness, shine, thickness, volume and strength and polish. Soos shampoo is rich with dead sea minerals, beeswax, honey, Vitamin C, E, olive oil, nettle and celery. The ultra creme of Soos Pet conditioner penetrates skin and hair to deeply hydrate. It is safe and great for use on humans and animals. The product is 97% natural, pH balanced for pets and cruelty-free. As there are so many products in Soos pets shampoo range, we have taken here the customer reviews on some products of the Soos natural pet shampoo. These were found in amazon. The customer reviews on Soos pet shampoo were pretty good. “Love the Vitamins and natural elements in this dog shampo” says Brittany. She adds “ Having 2 dogs, I am always trying to keep any unnecessary chemicals away from them. So when I was offered the opportunity to review this in exchange for my honest, unbiased review, I jumped at the chance. T start out with, I love the idea of this dog shampoo. I think it’s wonderful that there are so many vitamins and natural elements in the shampoo. Even though my dogs don’t have allergies, I thought it would be great to try the hypoallergenic shampoo because it would expose them to less harmful ingredients. My dogs were definitely clean after using and this didn’t cause any dry skin that other shampoos we have used has caused. However, I did find that the bottle was smaller than other dog shampoos that I’ve used. I found it pretty watery. I will definitely keep using this shampoo, but just a warning for other purchasers that you may no receive the same consistency as other dog shampoos. I would definitely use this shampoo again and recommend it to friend. He says “Pleasant scent didn’t react poorly with my dog’s skin. Left the fur very glossy and soft. I would definitely use this shampoo again and recommend it to a friend. Disclosure: I received this product at a discount in exchange for an honest review. “Love it and will recommend” says another Amazon customer. “I just found about this shampoo from a friend and I love it, my dog’s fur look nice and shiny. Also best smelling shampoo that I have ever used. I will recommend this to my friends and family. “Five stars” – says Mayer.S on Amazon. “The best smell ever”. Where is Soos pet shampoo manufactured? Soos Pet shampoo is manufactured in Israel, right by the Dead Sea. Is it safe to use Soos Pets shampoo for dogs and cats? The company has a proprietary relationship that allows them to access to fresh, pure products. Many other Dead Sea products that are available in the market are diluted and stuffed with harsh chemicals. Because Soos pet products are made right next to the Dead Sea, they are the purest possible and authentically Dead Sea. Does Soos pet shampoo and Soos products have unnatural ingredients? Products that are made of natural components have a very short life. To preserve the effects of natural ingredients used in Soos pet products, the company has used a small proportion of unnatural ingredients; nonetheless, the company strives to keep the mandatory unnatural ingredients at the lowest possible levels. There are no harmful preservatives like parabens or SLS. From where to buy Soos Pets shampoo? You can buy Soos Pets shampoo online from their official webpage or amazon.